Pleasant surprises often appear when least expected. Such was the case with little Royer Chapel, which sets back off winding Route 83 on Franklin Township Road 280, very near Wills Creek Dam in Coshocton County. 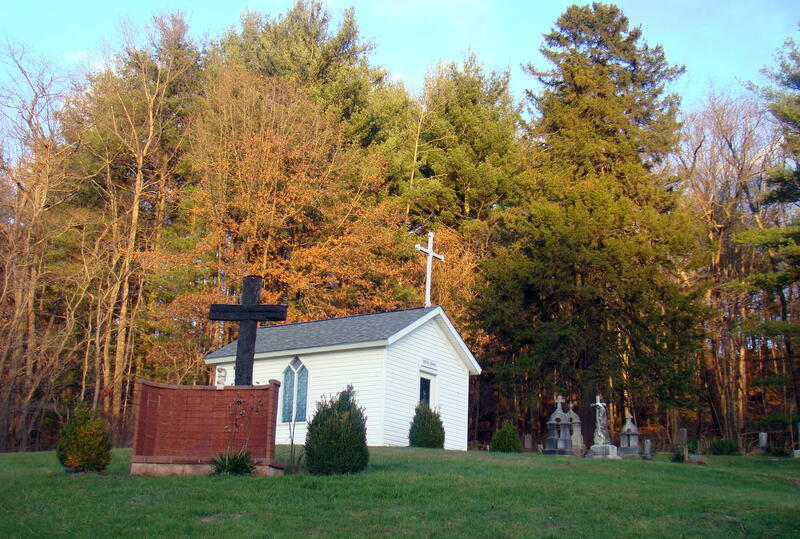 Many claim that Royer Chapel is the smallest chapel in Ohio. Originally built in 1897 through the efforts of Anne Royer, the chapel served as a memorial to her husband, Martin. Wood from an abandoned St. Nicholas Church and a stained glass window from old St. George Church were used in the construction. When arriving at the chapel, a cross made of burnt wood stands out behind the Memorial Wall. Later information discloses that the original church was destroyed by arson on December 8, 2002 and rebuilt by men of the community a few years later. Two crosses were made from the burnt wood – one outside and another inside above the altar. Funds for constructing the new chapel were raised in part from memorial bricks engraved with the names of loved ones or contributors. The Memorial Wall standing out front was built with these same bricks. 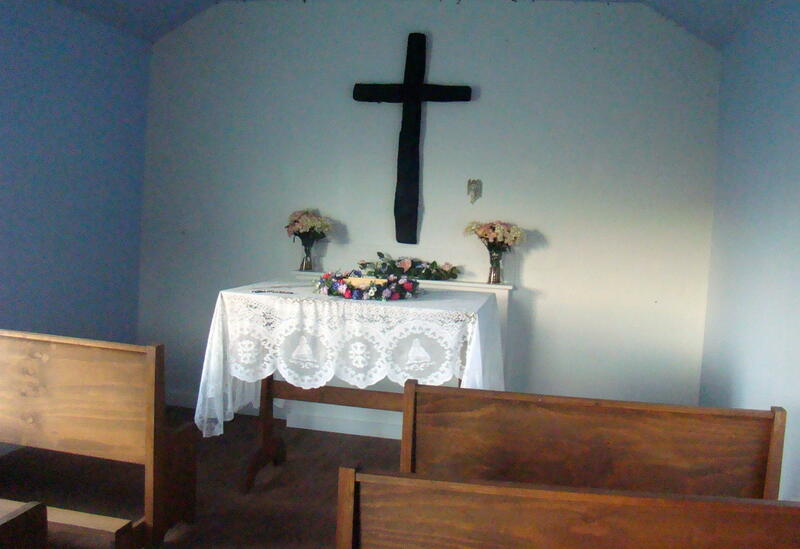 Tiny Royer Family Chapel measures about ten feet wide by eighteen feet long, and is located near a cemetery where Martin and his daughter, Clara, were buried in 1888 and 1896 respectively. Clara’s monument, which was imported from France, displays a statue in her actual likeness. 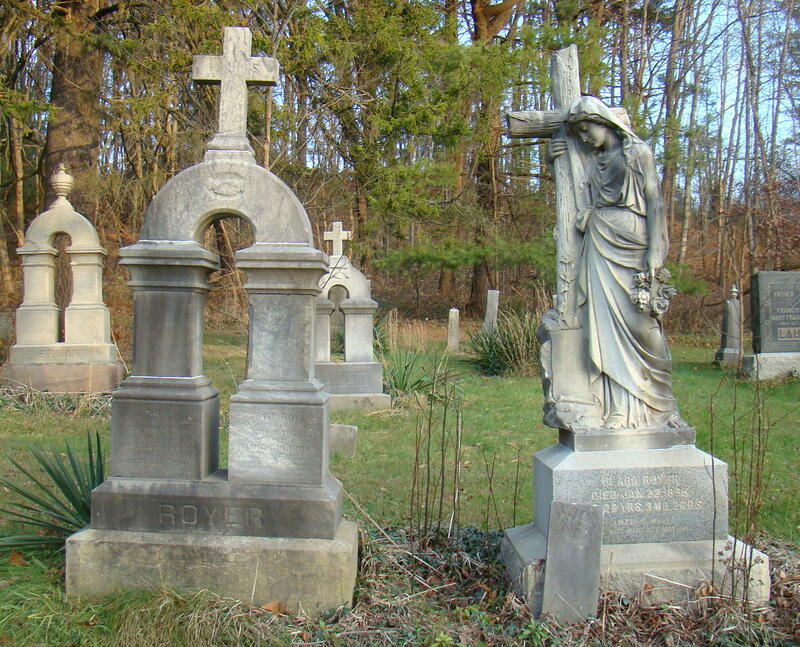 The chapel and cemetery were located across the road from the old family farm to accommodate Anne’s frequent visits. Don and Esther Royer initiated the reconstruction process to keep alive family tradition started by Don’s great-great-aunt Anne. In ten days, four hundred friends and neighbors signed their petition for assistance, so they knew the community supported their plans to rebuild the chapel “just like it used to be”. Since Don and Esther’s wedding had taken place there years before, they had pictures showing exactly what it looked like inside. Those pictures made it easier for Don, in his own shop, to build new pews and windows to closely match the originals.The reconstructed chapel was built on a new foundation but maintained its original size. In a recent phone conversation, Anne recalled her wedding day. The seven pews of Royer Chapel were crowded with twenty-one family members. When they turned to walk down the aisle, through the door she could see the yard outside the building filled with her fellow workers from the Coshocton Tribune. Inside, a peaceful chapel scene appears when you gently open the door, which is never locked. 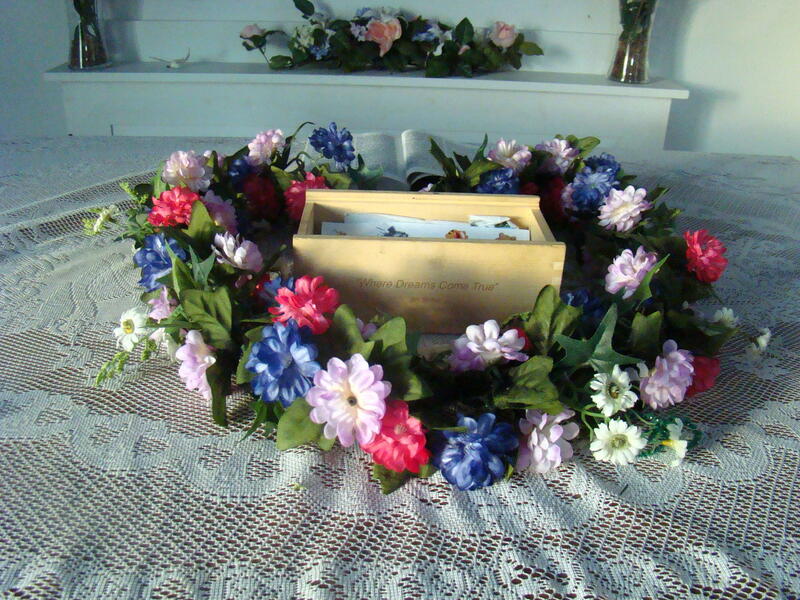 At the front of the chapel, a table contains a prayer box surrounded by a wreath of flowers. The inscription on the side of the box reads: Where dreams come true. Inside the box are numerous requests written on slips of paper available on the table. Here’s a great place to sit down and enjoy the silence of peace while reflecting on life and its many twists and turns – rather like the road leading to the chapel. While electricity, water, and heat do not exist at Royer Chapel, services were held every Sunday until recently when they were changed to approximately once a year. Maybe you will want to take a half hour leisurely drive northwest of Cambridge and explore a hidden treasure nearby. 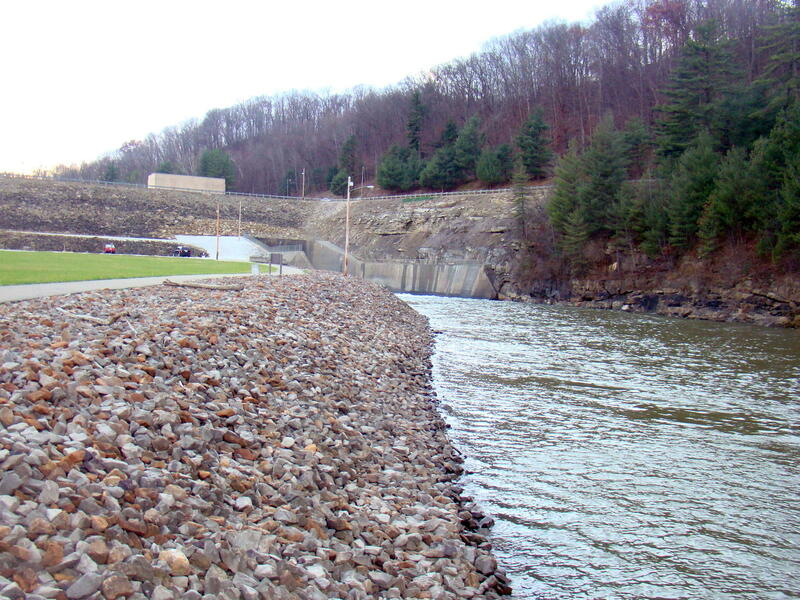 You might even want to take a short drive to Wills Creek Dam. Waters flow north on Wills Creek from its beginning near Pleasant City to where it flows into the Muskingum River near Coshocton. This little chapel on the hill serves as a reminder to be thankful for the small things in life – a smile, a card or email, the joy of each new day. Royer Chapel can be reached traveling State Route 83. If traveling north from New Concord, Ohio you will pass through Bloomfield and head down the hill toward Wills Creek Dam. It is approximately 15 miles from New Concord to the dam. The church is difficult to spot unless you are watching. It sets on the east side of the road and can be clearly seen as soon as you turn onto Franklin Township Road 280, while Wills Creek Dam is on the west side about a mile down the road. Approaching from Coshocton on 83, directions are reversed.